The lives of Jewish people are marked by episodes designed to comply with divine commandments and the precepts of the law. Different documentary and pictorial items illustrate these episodes, such as marriage and birth. The community celebrates and keeps alive its historical and religious memory through different festivals celebrated on certain dates throughout the year. Different items, which are still used nowadays in Jewish festivals and celebrations, are exhibited here. Ink on parchment. 1377, Castelló d'Empúries (cession of Girona Historical Archives). When formalising an engagement, a contract was drawn up concerning the rights of the bride on issues such as the dowry and family life. This ketubah is for the marriage between David, son of Messul·lam de Gallac, and Astruga, daughter of Abraham ben Jucef, from Castelló d'Empúries. 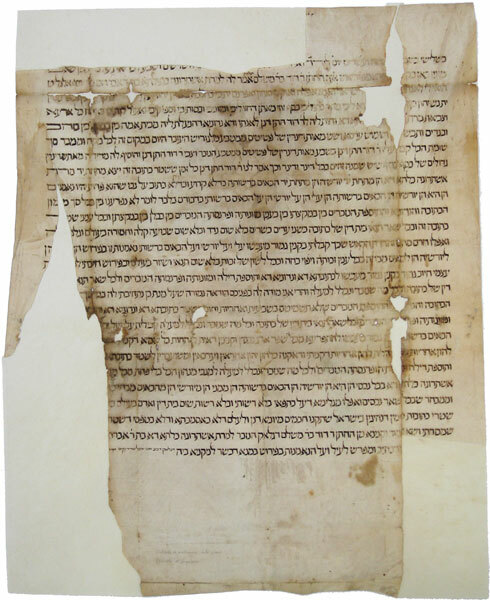 This is the only Hebrew marriage contract from Girona, and one of the most beautiful and best preserved examples in Catalonia. The scroll would have been part of the binding of a volume of notarial records. 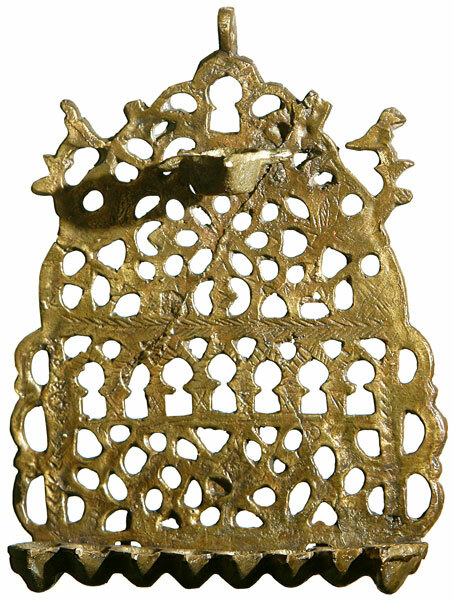 Gilded metal, 14th century, Catalonia (copy of the original in the Museum of l'Espluga de Francolí). Bears an inscription in Hebrew meaning "Enjoy your meal". The Matzot were unleavened bread eaten during the Feast of Passover (Pesach). 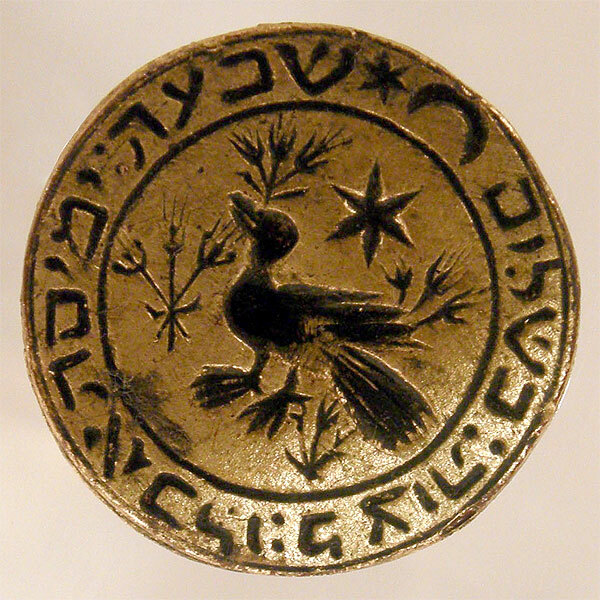 To be considered suitable for consumption by the Jewish community, they had to be marked with special seals like this one. 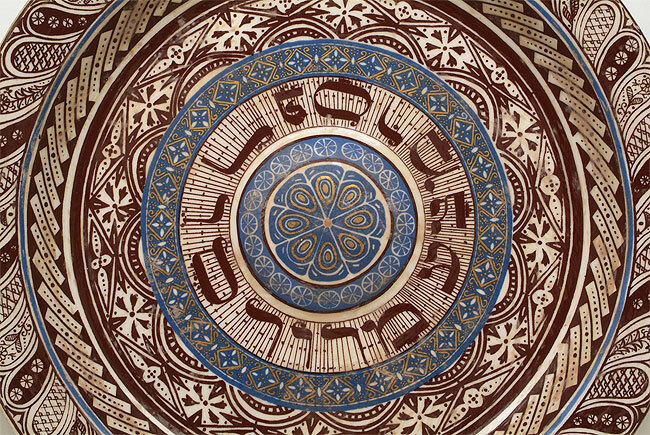 Decorated ceramic. 14th century, Catalonia. Reproduction (original at Israel Museum). During the Passover meal (Seder Pesach) ritual foodstuffs were eaten which were placed in a precise order on special plates like this one. Metal. 19th century, Morocco (cession of Mr. Uriel Macías). Eight-stemmed oil lamps were used during Hanukah, the Festival of Lights, which takes place during the month of Kislev (December). A wick was lit on one stem per night, until the end of the week-long celebrations.